Martin Freney has completed a PhD at the University of Adelaide, School of Architecture & Built Environment, the focus of the research: Earthship thermal performance and environmental impacts. He has travelled to the Earthship communities in the USA twice to conduct his research. Here is a link to his thesis which includes fascinating insights into the wonderful world of Earthships: interviews with Earthship occupants, an interview with Mike Reynolds, data on temperature, humidity and indoor lighting in six Taos Earthships, and lifecycle assessment (environmental impacts) of Earthships compared to other types of homes of various wall constructions. The graphs above show winter (top) and summer (bottom) thermal performance of a Global Model Earthship in Taos New Mexico USA. It shows a remarkably stable indoor temperature (black line) and it shows that the greenhouse (green dotted line) midday temperature peak is lower in the summer than it is in the winter - who would have thought it!? The grey line shows super cold outdoor temps in the winter, and hot summer temps (mid thirties for 6 days out of 7). The dotted red line shows the intensity of the sun light. Using thermal modelling software, the temperature in a building can be predicted based on the climate it is built in. Using the local Taos weather data, it was possible to predict the temperature of this particular Earthship home (six were monitored) very accurately. Using the same model, Earthship performance was predicted in Adelaide, Australia, Paris, London, and three locations in Spain. Results of Marty's research have been published and peer reviewed (see list of publications below). Using Life Cycle Assessment software, the environmental impacts of Earthships were compared to other homes of the same size (floor area). The focus was on wall materials such as mud brick, strawbale, rammed earth, brick veneer and timber frame. Another issue that was investigated was the Earthship off-grid systems (electricity, water and sewage) compared to conventional "grid connected" homes. Although Earthship wall construction had the potential to reduce environmental impacts compared to other wall types (it was similar to mud brick) it was the Earthship off-grid systems that made the big difference. The off-grid Earthship had less than a third of the environmental impacts of a conventional grid connected home constructed with brick veneer walls. The graph above shows potential environmental impact for various homes over their full lifecycle. It takes into account not only Global Warming Potential, but also Ozone Depletion, Smog, Water Depletion, Water Pollution, Land Transformation/Use and Embodied Energy. (I also looked at toxicity but this is not factored into the graph above). From the left there are four very low impact homes, the first is a "low embodied energy" Earthship in which adobe has been used instead of cement in the bottle/can walls. It also has no berm, no greenhouse, and is insulated on the outside of the tyre wall with 100mm of expanded polystyrene (EPS). Next is the Mud Brick home which is assumed to be off grid like the Earthships. You can see that compared to the first Earthship it uses about double the amount of heating/cooling electricity (purple bar) to heat it. Then in third place is the authentic Earthship design with greenhouse and berm, however it is assumed to be "low embodied energy" (reduced cement use). You can see that it uses basically zero energy for heating/cooling (purple bar almost disappears). And then in fourth place we have the same Earthship but with the usual cement can/bottle walls which adds some impacts to the materials and construction "thermal envelope" category (green bar) but is otherwise the same as the lowEE Earthship. The remainder of the homes are assumed to be grid connected to the South Australian electricity, gas, water and sewage grids. From left to right there is Strawbale, Rammed Earth with insulation, Rammed Earth (no insulation), Reverse Brick Veneer, Timber Frame, Brick Veneer, Concrete Block, and the last two are Brick Veneer with different assumptions about household energy use. The large impacts for the grid connected homes - labelled as "water and wastewater" (pink bar) - was due to the impact of electricity used to pump water and wastewater to/from the home. The water use itself was also an issue. Bottom line: build an energy efficient, water efficient house anyway you can - and get off the grid - the grid is bad for the environment, at least it is for now... maybe later, a lot later, perhaps $10 billion later, the grid will be much greener. But for now it is a liability. And whatsmore, when the grid is down - your house doesn't work so well. Because the Earthship has basically zero heating/cooling energy requirement (in Adelaide climate) it is hard to beat for off-grid energy efficiency - this is due mainly to the berm and greenhouse. Freney, M., Soebarto, V., & Williamson, T. J. (2013). Earthship monitoring and thermal simulation. Architectural Science Review, online. Freney, M., Soebarto, V., & Williamson, T. J. (2013). 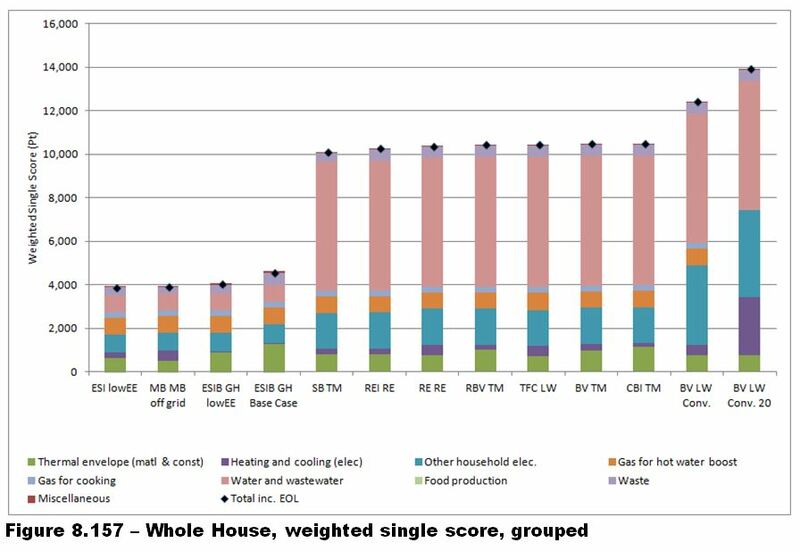 Thermal comfort of global model earthship in various european climates. Paper presented at the 13th International conference of the International Building Performance Simulation Association, Chambery, France. Freney, M., Soebarto, V., & Williamson, T. J. (2012). Learning from ‘Earthship’ based on monitoring and thermal simulation. Paper presented at the 46th Annual Conference of the Architectural Science Association, Griffith University, Queensland Australia. Freney, M. (2009) "Earthships: sustainable housing alternative", International Journal of Sustainable Design, vol 1, no 2, pp 223-240. Freney, M. (2008) "Evolving Towards an Ecological Society", proceedings of the 3rd International Solar Cities Congress 2008, 17-21 February 2008, Adelaide Convention Centre, South Australia.